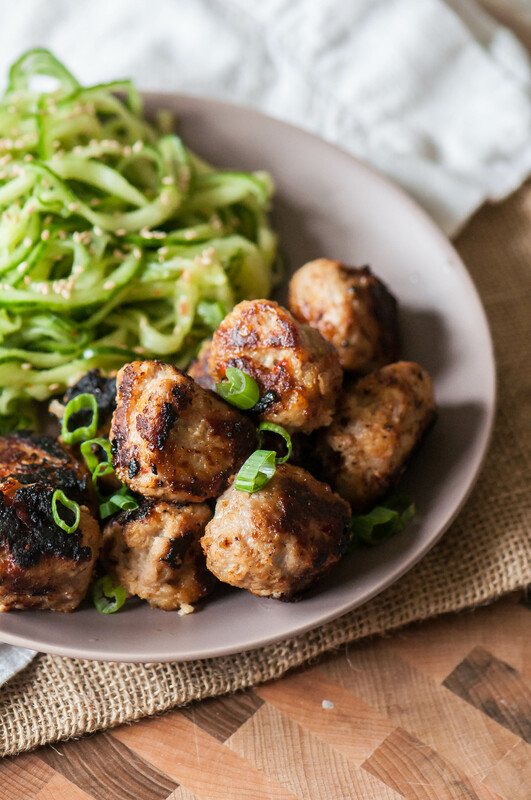 Thai Turkey Meatballs with Spiralized Cucumber Salad is my official meal of Spring. It’s filled with light, refreshing, good for you ingredients that will keep you full and happy without weighing you down. This post may contain affiliate links. That means if you click through and purchase through the link, I may receive a small commission at no cost to you. I only recommend products I love and use often. For more information on my disclosure policy, click here. The end of school is fast approaching. I always wanted to be one of those moms that loves revels in spending every moment with their kids. All the art projects and messes and trips to the park. But I’ve got to say that’s not what ended up happening. I love my kids and I enjoy doing those aforementioned things with them. But all day. Every day. For almost 3 months. It’s just too much. Somebody send help because I’ve only got three weeks left of sanity. My kids and I both thrive with a schedule so I’m starting to work on one that will hopefully be successful throughout the summer and leave me a little time here and there to work on this blog I love so much. I’m also considering creating one of these activity jars for when they are boooooored. Another priority is to hide my phone and set aside the to-do list when we’re playing. If you more experienced parents out there have any summer survival tips, let me know in the comments below. One thing we do a lot of together in the summer is cooking of course. And I forsee these Thai Turkey Meatballs with Spiralized Cucumber Salad being a popular dish for several reasons. First, and most important, everybody ate it. Second, it’s really fun to make with the kids. I don’t like them handling raw meat so I give them my scoop to portion out the meatballs (additional plus, they are all the same size and will cook evenly). They do surprisingly well taking turns with this task. Even more fun is using the spiralizer. The sharing may not go over so well with this one…I’m speaking from experience. Luckily, this recipe calls for 2 cucumbers so they each got to spiralize one. I kind of felt left out of the fun but I got over it. This is one of those light, refreshing meals that leaves you completely satisfied. I love the combination of the rich, slightly sweet hot meatballs with the cool zippy cucumbers. It’s one of my favorite creations of the year so far. Another bonus, so much of this meal can be done ahead of time and tastes better if you do. The cucumber salad is so much tastier if you make it a few hours ahead of time or even the night before. It gives the cucumbers time to soak up the sauce and the flavors mingle. The meatballs can be mixed and formed ahead of time too so all you have to do is cook them up and dinner is served. That will give you more time to do all those *fun* things all day long. Pray for me. For the cucumber salad: whisk together the vinegar, sweet chili sauce, sesame oil, sesame seeds and salt. Toss cucumbers in the sauce and refrigerate. Heat skillet over medium heat. In a large bowl, combine ground turkey, panko, garlic, ginger, salt, sweet chili sauce and green onions. Form into balls. Melt a couple tablespoons of coconut oil in skillet. Cook meatballs until caramelized and cooked through.